Are you an active user of Twitter, a powerful social media tool? It is a short message communication tool that enables the users to send messages that is limited up to 140 characters. These messages or tweets can include a link or any web content or a video or even a photo. With more than 313 million active users, today it has become a powerful marketing tool that most business users use to spread their company message and boost their brand. Users have tried various means to leverage the popular 140-character message option to drive traffic to their business or to spread any kind of information related to varied topics. But due to its character limitations the users are more like a person who is strung up in a cage unable to express thoroughly. Keeping oneself restricted to the limited characters often became a cause of frustration as they could not express their thoughts completely and had to shorten the messages often delivering half or incomplete information. This slowly became a big burden for the users. When Twitter first started its service, the tweets were limited to 140 characters as they followed the length of an SMS message. SMSs are limited to 160 characters and Twitter used 140 characters for the message and the rest 20 for the username. Soon with this option before the users, Twitter gained much popularity and soon became a very popular platform for sharing new, latest updates, jokes and etc. The company was trying to increase the length of the tweets for the past many years and at one time it was also decided to introduce the 10,000 characters for a tweet. The identity of a tweet was actually derived from the shortness of the message and also the real time nature of the tweet. And when the tweet of 10,000 characters showed up a Facebook style feed, it threatened to create confusion among the users about the product and finally the company had to compromise on the idea. Recently on Tuesday, Twitter announced that it has increased the character limit from 140 to 280 characters for single tweets and it has been announced only after thorough testing done among a handful of users since September. It was checked whether the increase in character count helped the users to express themselves in a better manner and also decreased cramming. 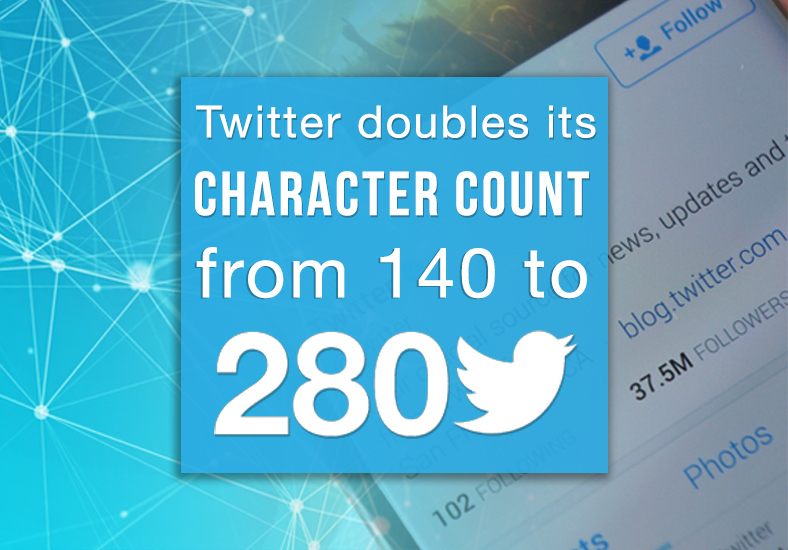 It was confirmed that the 280-character length would be available to all the users, though some languages like Korean, Chinese and Japanese would maintain the previous limit of 140 character. The increase in length is sure to help user, business owners, marketers to express their ideas freely and also spread informative message in a clear manner. It is true that very limited people crossed the length of 140 to write any message and only 5% of the tweets sent by the users were more than 140 characters. But the company has tried its best to ease the stress on the users by giving them the opportunity to fit more thoughts into the text by doubling the limit. It is said that the best tweet should always be to the point, expressing the thoughts or information that matters. The company is also open to expanded tweets for more Asian language in the coming future that will help users to write without keeping the restrictions in mind.